But the symmetrical quality of this kind of analysis, whilst undoubtedly elegant, may come to seem too static (whether itis Eliot herself or not who comes to be blamed as excessively schematic). The dialectics of nineteenth century history and Sociology are productive, beyond simple duality, of third terms, in which synthesis may be less the resolution of conflict than its extension or evolution. The metaphor of "web" itself, used by both Eliot and Harvey, points beyond duality to a multi-pointed complexity. Middlemarch begins, for Dorothea, with a triangular relationship, in which her sister, Celia, plays the role of resolving third party to the blocked embarrassment of her rejection of Sir lames. This relatively uncomplicated movement gives place to, and is indeed itself in part shifted by, a three-way tension of much greater importance to the heroine, involving her first in the maturing disillusionment of marriage with Casaubon, and then at last more happily, in the romance and sacrifice of marriage with Ladislaw. This central triangle, in which Casaubon comes to play an ignoble and ludicrous part as jealous husband, may be offset by a more obscure relationship, in which Farebrother, George Eliot's surprisingly exemplary clergyman, plays a generous, pastoral role of self-effacement in his sustained, heroic encouragement of Fred Vincy to become worthy of Mary. It is not perhaps surprising to find such three-part patterns in a novel which intends to make at last so full and honest an exploration of marriage. The bourgeois family, spreading out in variety and influence far beyond the bounds of Middlemarch, can be characteristically seen as triangular, from its sublimest manifestation in the Holy Family, to farcical presentations of adulterous lovers and deceived or outraged husbands. Even the mother-in-law of the stand -up comedian can be seen as having a place in this perspective. 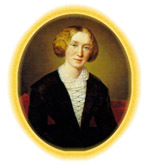 George Eliot, in her own life, was fully, even painfully experienced in the triangularity of marriage. In her decisive relationship with Lewes, she was the second, illegitimate wife, opposed by the scandalous legitimacy of Agnes. She was also, in many respects more effectively than Agnes, the mother of George' s grown, or growing children. Her earlier involvement with Chapman had similarly been multi-triangular. His large house in the Strand, in which Marian Evans took a room in November 1850, already contained his wife, two of his children, and their governess, who was also Chapman' s mistress.